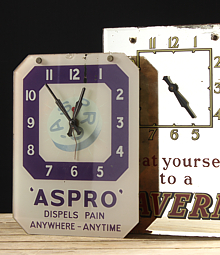 The history of clocks is a fascinating one! 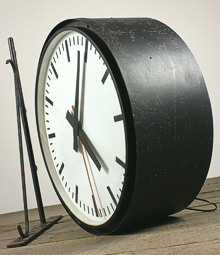 The first mechanical clock was invented towards the end of Middle Ages, and it is thought the oldest known working clock is in Salisbury Cathedral. As the first clocks worked by weights they were very heavy and expensive, which is why they were mostly located in churches. 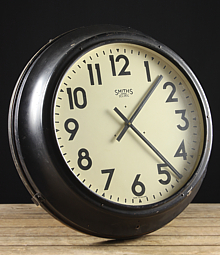 The invention of the main spring (which powered the clock by storing energy harnessed by manually winding up the clock) reduced the size and weight of clocks considerably. 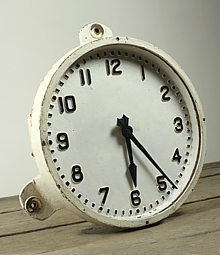 Here at English Salvage we have a range of reclaimed clocks available, most tend to be vintage, industrial style wall mounted clocks, though we do sometimes have the occasional carriage, tambour or bracket clock.